A 46 year old healthy male presented with a “flu-like illness.” He reports three days of headache, myalgias, nausea, vomiting, fevers, and chills. No other associated symptoms. His children have been sick with “the flu,” so he suspects he likely has the same. HEENT: NCAT. Conjunctival suffusion. Sinuses non-tender. TMs and OP are clear. No LAD. MMM. Heart: Tachycardic and regular rhythm. No murmurs, rubs, or gallops. Lungs: Clear to auscultation bilaterally. No respiratory distress. Abdomen: Soft, non-tender. No rebound, guarding, or distention. Neuro: Alert and orientated x 4. Moving all extremities. Skin: Warm and dry. No rash. Figure 1: Conjunctival suffusion. Source: American Journal of Tropical Medicine and Hygiene, 2012. Given concern for possible dengue fever and/or leptospirosis, CBC and CMP were sent and remarkable for a mild transaminitis and thrombocytopenia. Confirmation testing for dengue fever and leptospirosis was not available. Given the patient’s clinical findings of conjunctival suffusion and his constellation of symptoms, the patient was treated empirically for presumed leptospirosis with oral doxycycline. The patient was discharged from the ED with a plan to return two days later for follow up and a repeat CBC. At that time, he reported complete resolution in his symptoms, with resolution in his laboratory aberrancies. Widespread zoonotic infection found in both temperate and tropical climates, although there is a 10 times higher prevalence in the tropics. Etiology is secondary to infection by bacterium of the genus Leptospira, a spirochete. WHO models suggest about 873,000 cases worldwide annually with around 48,600 deaths, although this estimation is difficult to make due to under-reporting of the disease. Incidence is low in the US, with Hawaii reporting the most cases. In the tropics, the disease is prevalent/endemic in areas of poverty (poor housing and sanitation, subsistence living), and often peaks after large amounts of rainfall and flooding. Found in a variety of animals, although rodents are the most important reservoirs in terms of transmission of the disease. Rodents shed the organism intermittently in their urine throughout their lifetime, infecting soil and sources of fresh water. The spirochete can stay alive in the environment for days to months. Human infection is through exposure to animal urine or contaminated environment (soil and water). Consider the disease in patients traveling from high risk areas of the world. Figure 2: Prevalence of leptospirosis in 2015 on a gradient from white (0-3 cases per year) to red (>100 cases per year). Source: Yale News, 2015. Broad spectrum of clinical presentation, from mild, self-limited disease to severe and life-threatening disease. Average incubation period after inoculation is about 10 days. Abrupt onset of fevers, rigors, myalgias, and headache or “flu-like” syndrome; 75-100% of patients present with these symptoms. Conjunctival suffusion is often an overlooked clinically important finding. One case series suggests that it occurs in over half of patients with leptospirosis. It is not a common finding in other infectious diseases. 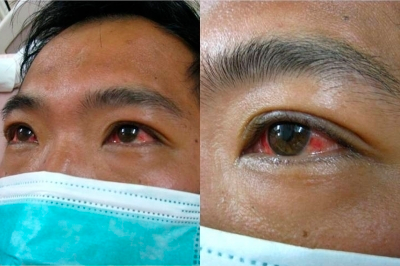 Conjunctival suffusion should raise a clinician’s suspicion for leptospirosis in an otherwise non-specific febrile illness. Less common findings include non-productive cough, nausea, vomiting, diarrhea, sore throat, lymphadenopathy, hepatosplenomegaly, and skin rash. These symptoms are seen in 30-50% of patients. Biphasic illness with a “bacterial” and “immunologic” phase, often overlapping. Complications include acute renal failure and jaundice, pulmonary hemorrhage, ARDS, uveitis, myocarditis, rhabdomyolysis, and multiorgan failure. The presence of ARF and jaundice in leptospirosis constitutes Weil’s Disease. Most fatalities are secondary to ARDS and multi-organ failure. Renal failure is often associated with hypokalemia and is non-oliguric. Patients may require renal replacement therapy. There is often full recovery of both renal and liver function with appropriate treatment. Based on one retrospective case-study, severe disease seemed to be associated with delayed antibiotic administration (greater than 2 days from initiation of symptoms) and infection due to the Leptospira interrogans serogroup. Laboratory findings are generally non-specific and include a normal white count (although a left shift might be seen), thrombocytopenia, hyponatremia, hypokalemia, elevated CK, and transaminitis (AST and ALT <200 IU/L, although significant hyperbilirubinemia of 60-80 mg/dL). Sterile pyuria and CSF pleocytosis, evidence of the immunologic phase of the disease. Chest x-ray may demonstrate small, nodular opacities. This is thought to represent alveolar hemorrhage or pulmonary edema, which portends a poorer outcome. Figure 3: The spirochetes of the genus Leptospira. Source: Health and Fitness Tips Blog, 2012. High index of suspicion is required and should be based on epidemiological exposure and clinical symptoms, especially given the non-specificity of laboratory and clinical findings. Serological testing is available, including ELISA testing, PCR, and cultures. ELISA diagnostic performing is considered variable in endemic regions, however PCR is becoming more available, and providing more accurate and timely diagnoses. Blood cultures are insensitive and typically only positive during the first 10 days of illness. Urine cultures can be positive for up to 30 days after symptom resolution. Empiric treatment is recommended in the setting of high clinical suspicion and in the absence of diagnostic testing. Antimicrobial treatment reduces duration of illness and shedding of the organism in the urine. Outpatient treatment is acceptable for minor illness, while inpatient treatment is reserved for those with severe disease. Oral doxycycline or azithromycin is recommended for outpatient treatment while IV penicillin/cephalosporin or doxycycline is recommended for inpatient treatment (with doxycycline only if rickettsial disease cannot be ruled out). Can consider prophylaxis with doxycycline if traveling to an endemic area with a high likelihood for exposure. “No one dies here without a dose of doxycycline” –Dr. Judith Fitzgerald, Hilo Medical Center, Hilo, Hawaii. 1: Lin CY, Chiu NC, Lee CM. Leptospirosis after Typhoon. American Journal of Tropical Medicine and Hygiene. 2012. 2: Mahmood F. What is Leptospirosis. Health and Fitness Tips. November, 2012. <http://daily-healthinformation.blogspot.com/>. 3: Greenwood, M. Global burden of leptospirosis is greater than previously thought, and growing. Yale News. September, 2015. <https://news.yale.edu/2015/09/17/global-burden-leptospirosis-greater-thought-and-growing>. 4: Speer, B. Introduction to Spirochetes. 1994. <http://www.ucmp.berkeley.edu/bacteria/spirochetes.html>. 5: Day, N. Treatment and Prevention of Leptospirosis. UptoDate. March, 2017. 6: Day, N. Epidemiology, microbiology, clinical manifestations, and diagnosis of leptospirosis. UptoDate. November, 2017.